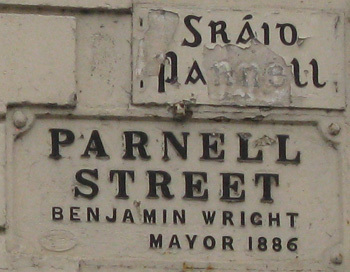 Parnell Street is currently named after Charles Stewart Parnell. He was an enigmatic personality, politically gifted and is regarded as one of the most extraordinary figures in Irish and British politics. He all but eliminated absentee landlords, the scourge of Ireland, during his period of influence. He created the Irish Party, the first modern disciplined political party machine, holding together all strands of Irish nationalism; he involved Irish-America in the Irish cause. He had the power to make and unmake governments in the United Kingdom and converted the British Prime Minister Gladstone to Irish Home Rule. Parnell was known as the ‘Uncrowned King of Ireland’. The street was previously named Bagwell Street, after the Bagwell family, who once owned most of the town centre. It served as the road towards Waterford, and also as the main link between the Military Barracks and the town centre. Charles Bianconi operated his carriage service from Hearns Hotel. Benjamin Wright, Mayor, was another self-publicist, who, along with an earlier Mayor, John Hackett, liked to see his name in cast iron all around town. anywhere a wall and a reason could be found to erect a plaque which included their name on it. Numbers 1-27 are situated on the south side of the street, beginning today at Paddy Power, bookmaker, and finishing at Clintons, Drapers. Parnell Street Numbers 28-57 are situated on the north side of the street. Jervis Place is contained within the street.